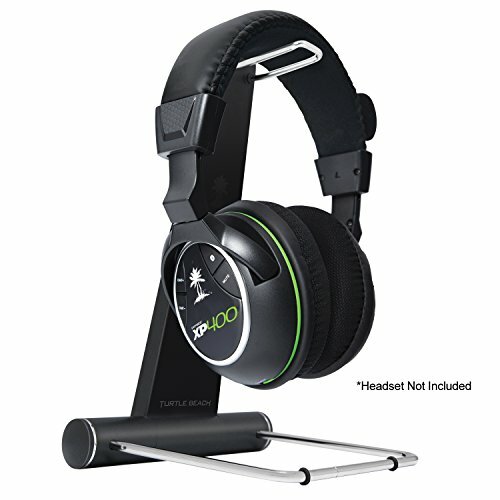 While gaming headsets have been rapidly changing over the past few years, headphone stands have finally started to evolve and catch up to the headset technology coming out in today’s gaming markets. Older headset stands were niche and quite expensive, but today’s models are great any kind of headset. Stands can keep your headphone in place so that they do not fall off your desk and break. A good gaming headset stand however, can often do much more. There are different options and quality that comes down to size and materials. In addition, some gaming headset stands have additional ports for charging and USB capabilities as well. Some headphone stands are made for audiophile. These come with high-grade materials like cherry wood, and others are budget-friendly gaming headphone stands that are made to hold any kind of headset. There are some features that you can look for in each headset stand to make an informed decision. Most headset stands are made from plastic or aluminum, but there are some unique stands that are made from wood. Durable aluminum construction works better for most headsets. The more budget-friendly headset stands are made from acrylic materials. Most designs feature a curved or cradle design. The curved design is very interesting as a piece by itself, especially if carved from wood. However, there are some curved acrylic pieces that are great for all universal headphones. Cradle designs are also sleek and feature some additional colors and styles. Headset stands should be quite universal for different headphones and offer a size that will match most headphones that you have today. Most headphones will display headphones of all sizes from Sony to Bose to Logitech styles. 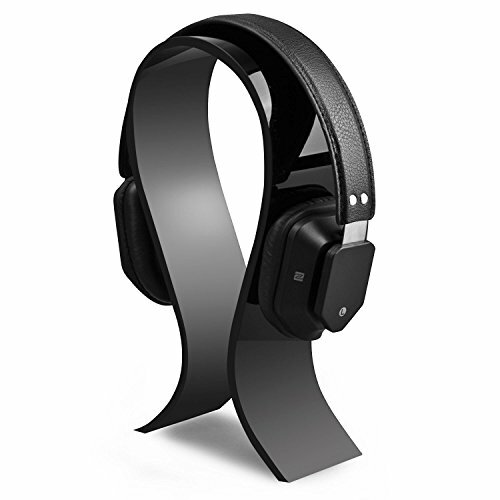 Some headphones have additional features or a different shape. All headphone set stands should state what headphone sets work best with the stand. If the stand is a little smaller or has a curved shape only suitable for certain sets that should be stated in the specifications. 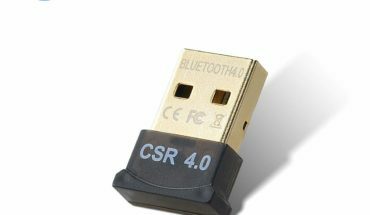 A number of features are included in some of the higher-end headphone models such as USB 3.0 ports and stereo quality audio jacks. Rainbow LED lighting and style enhancements also create a nice aesthetic for any gaming setup. Some headset stands are placed on top of the desk while others are bolted underneath and offer hooks to hang all of your devices from. This look is desirable if you want to be more discreet with your devices. Most under-the-desk stands have hooks to hold your headset. Most headsets tend to drop or get damaged from increased wear and tear. You can protect your headset by using a stand that is easily stowed on the top or underside of your desk. A headset stand will keep your headset in place but also provide some other conveniences such as USB ports and audio jacks. Most headset stands are extremely budget-conscious. You do not have to spend a whole lot to get a nice stand that matches your desktop gaming setup. Most designs feature a curved, simple look or have a cradle where you can sit the headphones. The best way to organize your desktop and keep your headphones from ending up on the phone is to use a headset stand. Headset stands break down into materials, simplicity, luxury, and other features for convenience and style. The following headset brands have a lot of style and function built into each design. AmoVee stands are ergonomic and made from acrylic materials. While previous versions of this headphone may have had a thinner dinner, this one has a thicker and more stable construction to fit all headphone styles. The curved design is really spectacular on its own as well as when displaying headphones. Its rather simple design works well within the budget, as it is a lost-cost headphone stand with no other frills. The warranty is a great asset for headset stands, particularly if it breaks or does not fit your headset like it should. 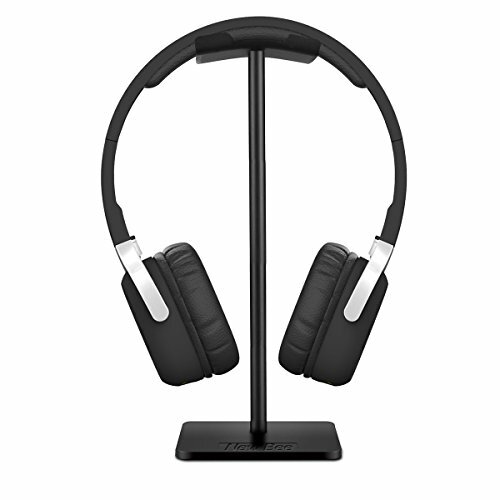 This headset stand also comes in a number of colors ranging from wood-grain to black to white. This form meets specifications for most headsets. The design does not include any extra ports or audio jacks. Construction may too be lightweight without any rubber legs to keep the stand in place. New Boo puts out a solid headset with a unique design and sturdy construction that makes it a great choice for anyone with a gaming headset. This stand features an aluminum supporting bar flexible headrest with an ABS solid base for all headphone sizes. All headset models should be able to fit this simple design. For a low budget, this is a great stand that will keep your headset in good shape and away from dropping on the floor. In addition, there is also a 24-monty warranty with a money back guarantee for any defects that you you experience. The gaming headset holder is 8.85 inches in height and 3.7 inches in length. This headset stand also has a cable holder and a very interesting aesthetic design. The sturdy design is made from steel and silicone. The foundation makes it more difficult for the headset to fall over. The silicone is a nice touch and takes care not to scratch the headphones where it sits on the stand. Most headphones will fit this stand as long it is within 4 cm in width and 25 cm in height. This headphone stand is an acceptable stand for those who just want something simple to hang their headset without worries that the stand will fall over. Cable holder is cumbersome to overall use of the stand. This headset stand comes in two colors and offers to protect your headphone from accidental drops with an acrylic design and stable base. The cradle had a cushioned rubber part to help prevent scratches on the headphone from sitting on the cradle. The design is very lightweight and comes in red or blue colors. 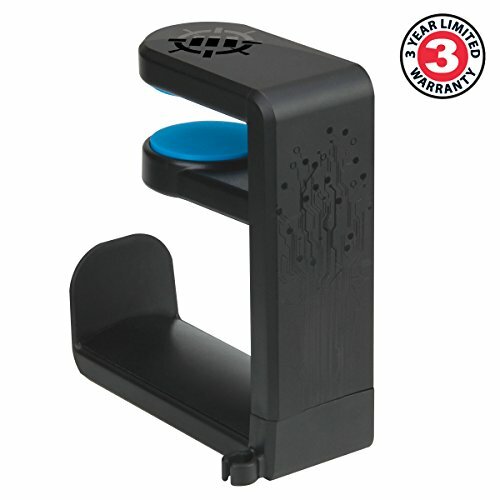 All headsets can fit on this cradle design, although a heavier headset may tip the acrylic stand. Very lightweight headset stand may be unstable with heavier headset models. 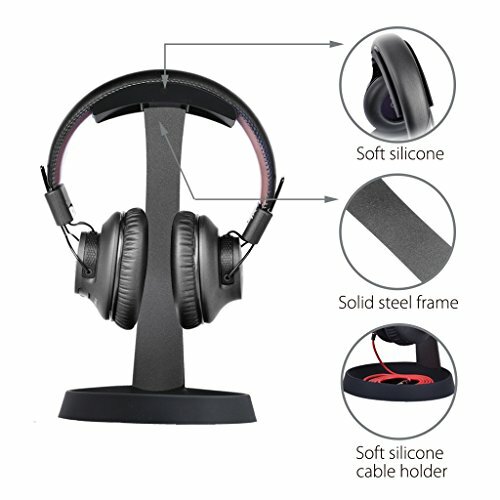 This is an advanced headset stand with a lot of features thrown in. Although a little bit more expensive than other headsets, this one has every cool thing that you could want in a headset stand. For one, the RGB lighting is a cool enhancement that can be controlled from CUE software. In addition, you have extra USB ports included with the headset stand so you can plug in your headset to charge or any other device that you want to connect to the computer. You can also plug-in speakers to create a great sound. The cradle fits all headphones. The stand itself is very stable and can hold a number of different headphones. The headset stand may be overkill if you are just looking for something cheap to hang your headset. The Turtle Beach Ear Force Headset Stand is a simple storage option that fits any brand of headset. The headset stand protects your headset from drops and extra wear and tear. The sleek design and chromed stand is also great to look at. The best part about this stand is that it has more stability than other headset stands in its price range.The rubber feet on the bottom do not allow any skidding and keep the stand in place. The headset stand is a little older and its design as not as modern as other headset stands. Some customers complained that the headset may fall under the weight of certain headphones. This cradle attaches under the desk and asks as an all-in-one cradle for multiple headsets, cords, and even smart watches. 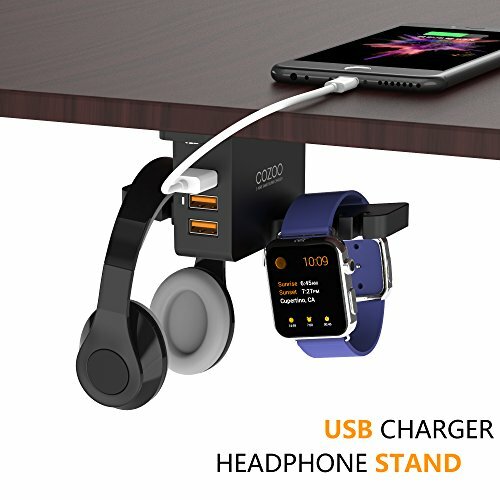 You can charge your devices using the USB hub. The design is a little awkward unless you install on a side of your desk that does not interfere with where you sit. The cradle is a little bit small, and headphones with larger bands may not be able to hang on the cradle. The USB ports offer additional charging for other devices but do not connect to the computer for additional options. The under desk design can hold multiple devices, but you may not like attaching it by drilling into your desk. 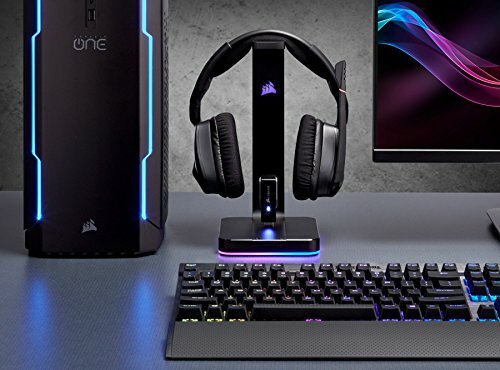 The Chroma RGB headset stand is a curved tower that offers RGB lighting that you can customize to sync up with other Chroma devices, such as the LED keyboard. The stand comes with amazing features for those who need more USB ports and love to match all of your LED lights at once. 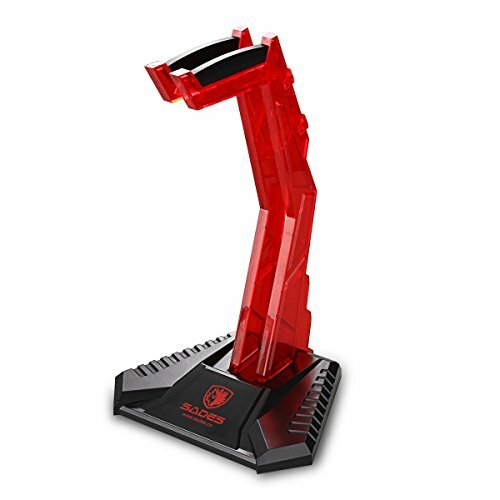 The headset stand fits all types of headsets including large Logitech gaming headsets. You can pick from pre-loaded lighting effects or customize the lighting based on your preferences. This cradle has a tower design and is more stable than most headset stands while also providing a unique lighting design. The ENHANCE PC Gaming Headset Holder is a discreet, black headset holder that hangs under the desk. The manufacturer uses an adhesive design so that you do not have to screw the hook into your desk. The hooks are also rotational so you can hook multiple cables and headsets onto the hook for organization and convenience. All headsets can fit this hook. 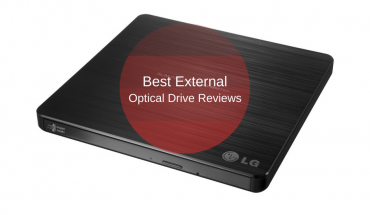 However, there are some questions about stability due to the adhesive design. The hook works for under-the-desk design, but it sticks out a little bit and may not hold heavier headsets. All of these headset stands offer something different for the user. 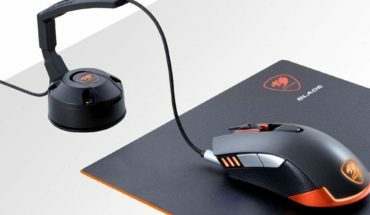 The best gaming headset stand may be one that is more budget-friendly, but the USB ports offer conveniences and additional charging options for all of your devices. 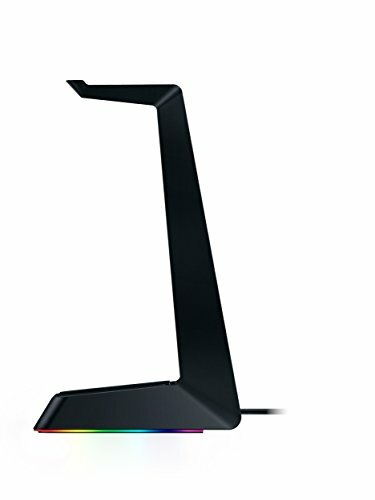 For that reason, we like RAZER Chroma and Corsair’s gaming headset stand best. The LED Lighting is a fun feature that may seem useless but also adds to a stylized desktop experience.